As we outlined yesterday, there's another tricky forecast on the way for northeast Colorado. Snowfall will be on the increase today across the Western Slope where several FEET of snow will be possible by Saturday. Winter Storm Warnings and advisories are already in effect for much of the high country as snow and blowing snow will cause dangerous travel conditions up there through the end of the week. Across the lower elevations of northeast Colorado the forecast has been a mess. Models have pretty remarkably been producing quite a bit of QPF (Liquid water amounts) for several days now, and while fluctuating about where the bulk of it ends up, the models have overall been decently consistent. That being said, there have been some serious questions about how well the models were handling this system. Very often with these types of storms the models rightly pick up on the abundance of moisture streaming in from the Pacific yet they miss the downsloping winds off the rockies that effectively kill snowfall chances in Denver. The other tricky bit is the temperatures. 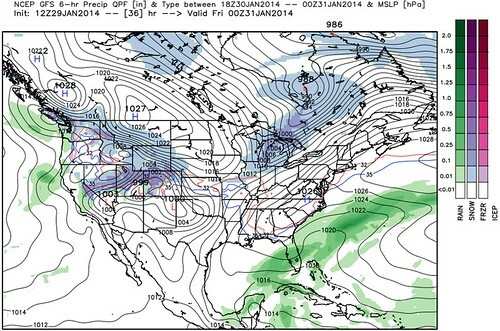 As models have been quite warm, there could be a rain/snow mix at least on the onset. Temperatures are less of a concern at this point, as this time of year it doesn't take much for things to cool enough for all-snow in Denver. As the 12z model suite comes in today, it's becoming increasingly evident that the upslope (key for snow in Denver) is trending deeper and stronger. What this means is that forecast confidence is growing that we see accumulating snowfall in Denver between Thursday and Saturday. A couple of cold fronts arriving from the north will correspond with the strongest jetstream wind above, and the combination is prime for making snowfall. Where the two "meet" is where the heaviest bands of snow will be. With that said, and like the previous system that came through Denver, jet dynamics will lead to snowfall banding which means a wide variety in snowfall totals across the Front Range. At this time we will broad-brush 3 to 6 inches for most of the metro area through Saturday, with snowfall totals closer to the foothills in the 4 to 8+ inch range. Be mindful of both the negative snowfall implications from this type of storm, and that (with banding) totals may be in excess of six inches for many areas when all is said and done. A lot to track over the next 24 hours, so please subscribe for updates as this storm continues to develop. We will be issuing regular updates as necessary.